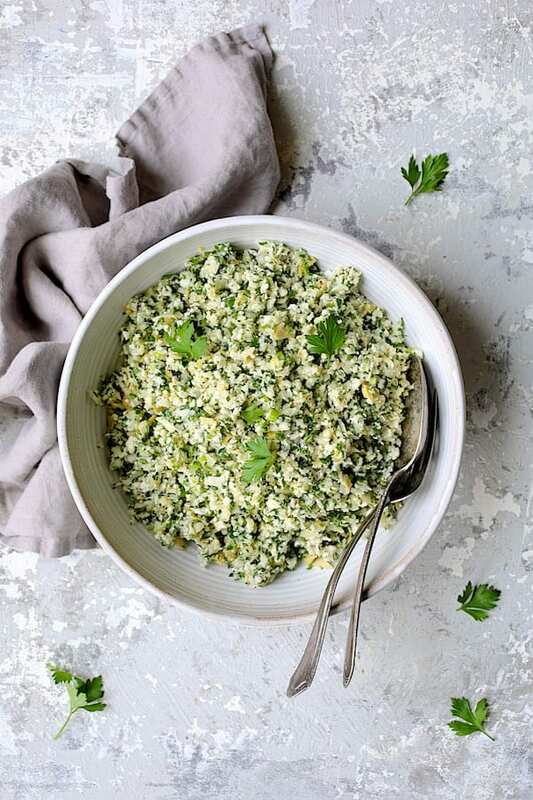 Cauliflower Artichoke Tabbouleh is a healthier, lower carb twist on traditional tabbouleh! With lots of fresh herbs, lively lemon juice and artichokes, it’s perfect for spring! Here in the South, mint is one of the first herbs to poke its freshness out of the ground in the spring. When that happens, I start to crave one of my favorite salads on earth: Tabbouleh! 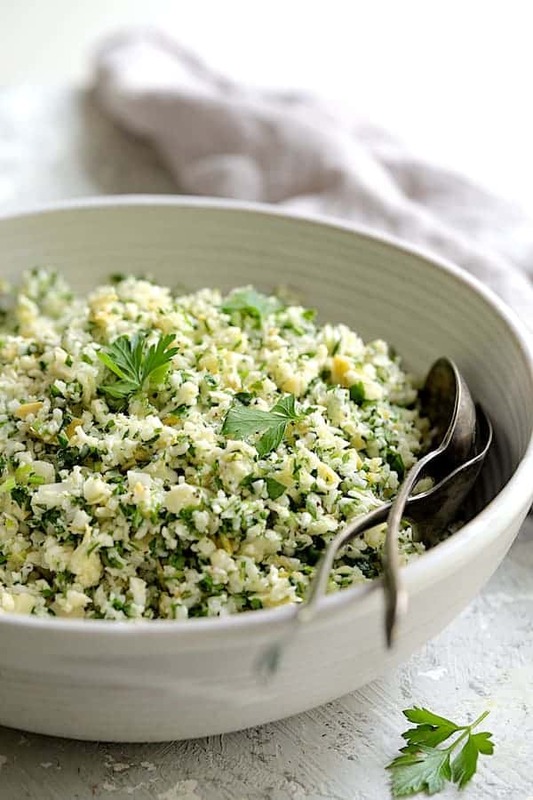 Tabbouleh (also spelled tabouli) is a traditional Middle Eastern salad made with bulgur wheat, lemon juice, olive oil and lots of parsley and mint. A true tabbouleh is actually an herb salad with a little bulgur mixed in. Cucumbers and tomatoes are sometimes added. 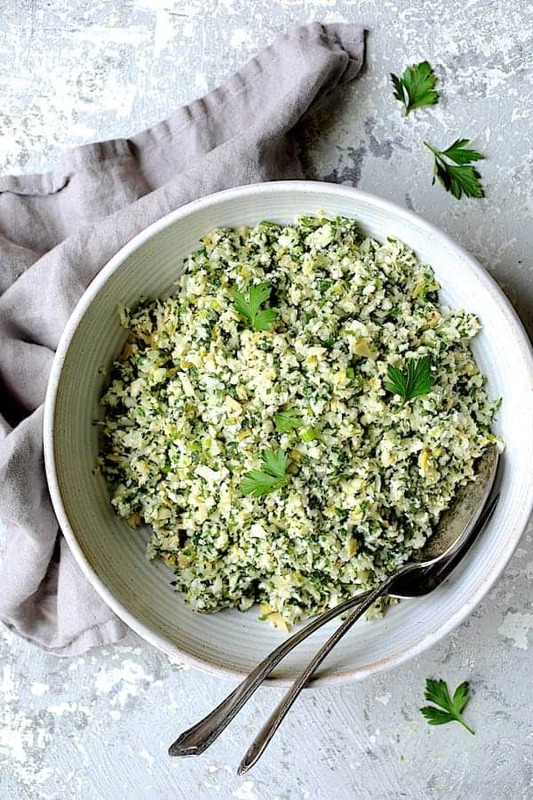 I love any version but I think this Cauliflower Artichoke Tabbouleh takes the prize! 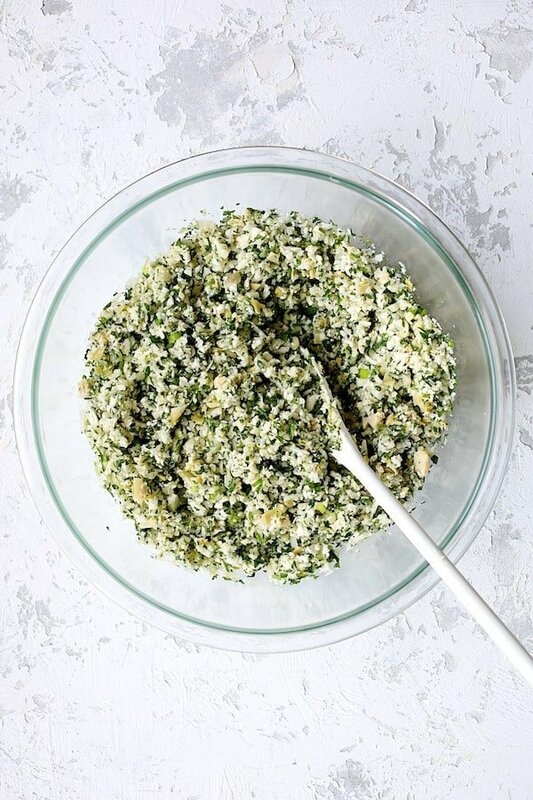 Over the weekend, I started to make a simple cauliflower tabbouleh to use up a head that was getting past its prime. I didn’t intend to share it here because cauliflower tabbouleh isn’t new. However, some artichokes from another recipe I’ll be sharing soon caught my eye and I decided to try cauliflower and artichokes together. Good call on my part because this cauliflower tabbouleh is definitely worth sharing! Alternately, use a food processor. However, you’ll need to be careful because cauliflower has a lot of water and it’s easy to over-process. Any cauliflower pieces that fall or you couldn’t grate can be manually chopped with a knife. Place the cauliflower, drained chopped marinated artichoke hearts, scallion, mint, parsley and garlic in a large mixing bowl. I prefer to use marinated artichoke hearts because they have more flavor for this salad than plain canned or frozen. Toss to combine then dress with lemon juice, a little olive oil and season with salt and black pepper. You don’t need a lot of olive oil because the marinated artichoke hearts are already oily. 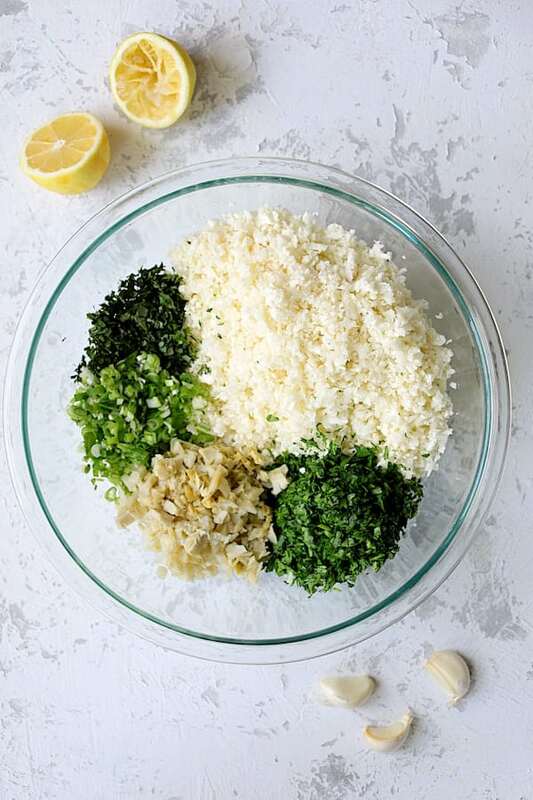 If you love tabbouleh as much as I do, be sure to try these other recipes! 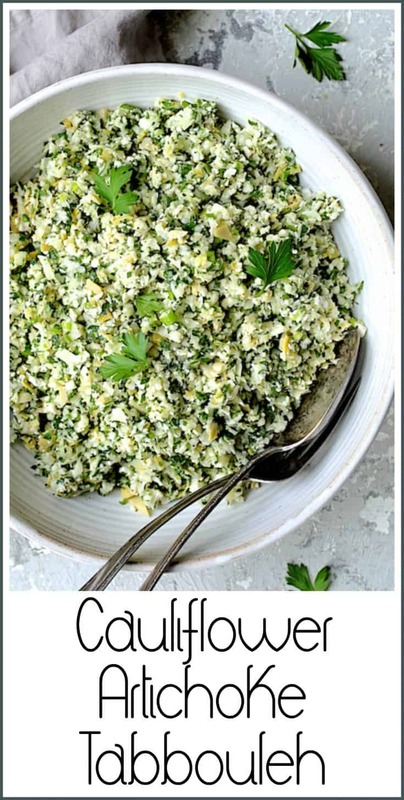 Cauliflower Artichoke Tabbouleh is a healthier, lower carb twist on traditional tabbouleh! With lots of fresh herbs, lively lemon juice and artichokes, it's perfect for spring! Remove outer leaves from cauliflower and cut head into quarters. Grate on a large-holed box grater. Transfer any large pieces that fell or pieces you couldn't grate to a cutting board. Coarsely chop the odds and ends manually. Place all the grated cauliflower in a large bowl. Add the chopped parsley, mint, scallions, garlic and artichoke hearts.